Born to a Roman senatorial family, and was well educated. Provincial fiscal procurator and lieutenant governor of Byzacena. He became a monk early in life, led to the religious life by the writings of Saint Augustine of Hippo, whose work remained a touchstone for him the rest of his life. Priest. Abbot. Bishop of Ruspe (modern Kudiat Rosfa, Tunisia) in 508, an illegal election in the Arian controlled land following the invasion of the Vandals led by Thrasimund. Exiled with 60 other bishops to Sardinia. There they built a monastery, and continued to write, pray, and study. He returned to Carthage in 515 to debate with Arians; he was so convincing that he was exiled again in 518. King Hilderic succeeded Thrasimund in 523, and permitted the exiles to return. Fulgentius preferred to return to his monastery and resume his studies, but he was such a popular preacher, he was kept busy in the pulpit until his death. The spiritual building up of the body of Christ is achieved through love. As Saint Peter says: Like living stones you are built into a spiritual house, to be a holy priesthood, offering spiritual sacrifices acceptable to God through Jesus Christ. And there can be no more effective way to pray for this spiritual growth than for the Church, itself Christ's body, to make the offering of his body and blood in the sacramental form of bread and wine. For the cup we drink is a participation in the blood of Christ, and the bread we break is a participation in the body of Christ. Because there is one loaf, we who are many are one body, since we all share the same bread. And so we pray that, by the same grace which made the Church Christ's body, all its members may remain firm in the unity of that body through the enduring bond of love. We are right to pray that this may be brought about in us through the gift of the one Spirit of the Father and the Son. The holy Trinity, the one true God, is of its nature unity, equality and love, and by one divine activity sanctifies its adopted sons. That is why Scripture says that God's love has been poured into our hearts by the Holy Spirit he has given us. The Holy Spirit, who is the one Spirit of the Father and the Son, produces in those to whom he gives the grace of divine adoption the same effect as he produced among those whom the Acts of the Apostles describes as having received the Holy Spirit. We are told that the company of those who believed were of one heart and soul, because the one Spirit of the Father and the Son, who with the Father and the Son is one God, had created a single heart and soul in all those who believed. Born to the wealthy Sicilian nobility, the son of the duke of Palermo, Italy and Rosalia Traino. When their children were grown, both of his parents entered religious life, and four of his sisters became nuns. Joseph renounced his inheritance and position in favour of his brother, and joined the Theatines on 24 March 1665. He studied philosophy at Messina, Ferrara, and Modena, Italy, and theology in Rome and Palermo, Italy. Joseph learned Greek, Ethiopic, Arabic, Syriac, Chaldaic, Hebrew, Italian, and Latin. He was ordained on 25 December 1673. Father Joseph was stationed in Rome and served as examiner of the clergy for Pope Innocent XII. He lived as a hermit, and was chastised by authorities for being over-scrupulous. 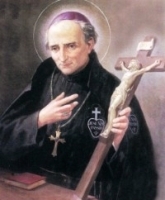 Studied and wrote extensively on the liturgy, publishing several titles under the pen name Joseph Marie Carus. Confessor to Cardinal Alboni; when Albani was elected Pope, he was reluctant to accept the throne. Joseph advised him it would be a mortal sin to refuse, so Albani became Clement XI. Consultor of the Theatines. Theologian to several congregations. Consultor to the Congregation of Rites, and to the Congregation of Indulgences and Sacred Relics. 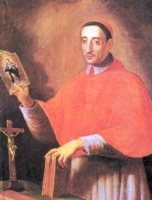 Though he insisted he was not worthy, he was created cardinal-priest by Clement XI on 18 May 1712. He was a prolific writer on theology, Scripture, and patristics. Known for his knowledge, humility, charity, and reforming work. Joseph always enjoyed teaching catechism to children. He is reported to have predicted the date of his death. Though he was not bound by law, Christ wanted to fulfill the law and to show His descent in the flesh from Abraham, and so was circumcised on the eighth day of his life (Luke 2:21), and received the name expressive of His office, Jesus, (Saviour). 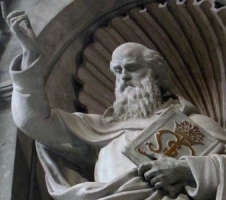 He was, as Saint Paul says, "made under the law", that is, He submitted to the Mosaic Dispensation, "that he might redeem them who were under the law: that we might receive the adoption of sons" (Galatians 4:4-5). "The Christ, in order to fulfil all justice, was required to endure this humiliation, and bear in His body the stigma of the sins which He had taken upon Himself." The circumcision took place, not in the Temple, though painters sometimes so represent it, but in some private house, where the Holy Family had found a rather late hospitality. The public ceremony in the synagogue, which is now the usage, was introduced later. As Christmas was celebrated on 25 December, celebration of Circumcision fell on the first of January. In the ages of paganism, however, the solemnization of the feast was almost impossible due to orgies connected with the Saturnalian festivities being celebrated at the same time. Even in our own day the secular features of the opening of the New Year interfere with the religious observance of the Circumcision, and tend to make a mere holiday of that which should have the sacred character of a Holy Day. Saint Augustine of Hippo points out the difference between the pagan and Christian manners of celebrating the day: pagan feasting and excesses were to be expiated by Christian fasting and prayer. The Feast was kept at an early date in the Gallican Rite, as is clearly indicated in a Council of Tours in 567, in which he Mass of the Circumcision is prescribed. The feast celebrated at Rome in the seventh century was not the Circumcision as such, but the octave of Christmas. The Gelasian Sacramentary gives the title "In Octabas Domini", and prohibits the faithful from idolatry and the profanities of the season. The earliest Byzantine calendars (eighth and ninth centuries) give for the first of January both the Circumcision and the anniversary of Saint Basil. 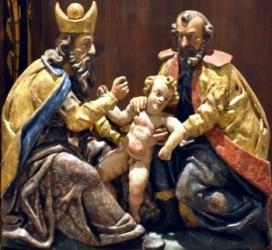 The Feast of the Circumcision was observed in Spain before the death of Saint Isidore in 636. It seems, therefore, that the octave was more prominent in the early centuries, and the Circumcision later. As paganism passed away the religious festivities of the Circumcision became more conspicuous and solemn; yet, even in the tenth century, Atto, Bishop of Vercelli, rebuked those who profaned the holy season by pagan dances, songs, and the lighting of lamps. Eldest of three children. Following a message from the Blessed Virgin, he became the spiritual student of Saint Paul the Hesychast. Monk at age 18 at Crypta, Phrygia (in modern Turkey), taking the name Peter. Ordained at Zygos, Greece. On the day of his ordination he healed a possessed man at the door of the church, which was the beginning of a ministry of healing. Noted confessor, able to read the souls of his parishioners. He began a pilgrimage with his teacher Saint Paul to Jerusalem, but they did not make it there. A vision from God sent them to Mount Olympus in Bithynia where Paul founded a monastery at the chapel of Saint Zachary near Atroa, and served as its first abbot. 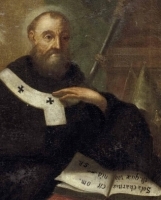 When Paul died in 805, 32-year-old Peter succeeded him as abbot. The monastery flourished, but in 815 Peter closed it due to the persecutions of the iconoclastic Emperor Leo the Armenian. Peter moved to Ephesus and then to Crete. Due to his support of the use of icons, Peter found that he was a wanted man. He escaped imperial troops by miraculously becoming invisible. He briefly returned to his family home where his brother Christopher and widowed mother received monastic habits from his hands. He then settled for several years at Kalonaros near the Hellespont, but his own fame as a healer forced him to move on. His wonder-working caused an accusation of practicing magic and invoking devils, but he was completely cleared by Saint Theodore Studites. Hermit near Atroa. Restored the Saint Zachary monastery and reorganized several others. However, after a few years of this work there was another outbreak of iconoclasm. This included his own bishop, and for their safety he sent his brother monks into hiding. When the persecutions turned violent, Peter retired to Saint Porphyry monastery on the Hellespont, and except for a brief visit to his friend Saint Joannicus of Mount Olympus at Balea, he never left again. Born to the French nobility, the son of Berald de Mercoeur and Gerberga who became a nun when widowed. Cured of unnamed malady in childhood by the intervention of Our Lady. Monk at Cluny at age 29. Abbot at Cluny in 994 at age 32 until his death. Promoted the Truce of God whereby military hostilities were suspended at certain times for ostensibly religious reasons, but which allowed enough commerce that people could survive, and which guaranteed sanctuary to those who sought refuge in a church. Instituted the feast now know as All Soul's Day. Known to sell Church property and treasures to feed the poor during times of famine. Declined the archbishopric of Lyon. Increased the Cluniac houses from 37 to 65. The cause for his canonization was pressed by Saint Peter Damian, who wrote a biography of him. Born to the Bohemian nobility. Married laywoman, and mother of four. Hers was not a happy marriage, and her largesse to the poor put her in frequent conflict with her husband. Dominican tertiary. Founded the Dominican priory of Saint Lawrence near her castle where she received Communion daily, an unusual practice at the time. Daughter of Paphnutius, a rich citizen of Alexandria, Egypt, born in her parents' old age due to the prayers of a monk who was a friend of the family. When she was grown, her family arranged a marriage for her to wealthy young noble, but she preferred religious life. While her father was on a retreat, Euphrosyne gave away her possessions, then became a nun and spiritual student of the monk who had prayed for her birth. To hide from her family, she wore men's clothes, and became a monk, using the name Smaragdus. She became famous for her holiness and wisdom, and became a spiritual teacher of her father, who did not recognize her. On her deathbed she revealed her true identity to her father who then became a monk, and lived in her cell the remaining ten years of his life. Modern scholarship indicates this was probably pious fiction that was mistaken for history, and that Saint Euphrosyne never existed. The fifth of eleven children born to Hendrik Paquay and Anne Neven, a pious couple who raised all their children to have a strong connection to the Church. Louis studied literature at the College in Tongres. He entered Saint Trond Seminary in 1845. When his father died unexpectedly in 1847, Louis left school to join the Franciscans, making his vows on 4 October 1850 and taking the name Valentine. He then resumed his studies, and was ordained on 10 June 1854. Assigned to the monastery of Hasselt, Belgium where he lived for the rest of his life. He served as sub-prior and prior of the house. Served as a Provincial Definitor from 1890 to 1899. Noted, eloquent and popular preacher. He wrote constantly. Had the gift of reading a visitor's consience, and became sought after confessor and spiritual director. Valentin had a strong devotion to the Holy Eucharist, and promoted frequent communion. He also had a great devotion to the Sacred Heart of Jesus, and encouraged it as well, especially to his fellow Franciscans. He prayed the Way of the Cross each day. Son of a druggist. His parents encouraged his vocation of a parish priest. Ordained in 1767. Joined the Passionists in 1768 after a retreat led by Saint Paul of the Cross. Professor of theology. Passionist provincial in 1781. Bishop of Macerata-Tolentino, Italy in 1801. Exiled in 1808 for refusing to take an oath of allegiance to Napoleon, but returned in 1813 after Napoleon's downfall. Saved Macerata from being sacked by Murat's troops. Instituted reforms throughout his diocese, ending such corruption that he received death threats. Indefatigable missioner and preacher. Worked with and for his people in during a typhus epidemic. On the death of Pope Pius VII, he resigned his see to become an advisor to Pope Leo XII. Roman Catholic in an area predominantly Greek Catholic. Suffered with respiratory problems all his life. Studied law for two years, but quit to enter the seminary at Lviv, Ukraine. Ordained in 1871. 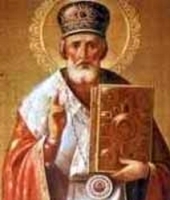 Senior priest of the parish of Saint Nicholas in Lviv. Organized The Affordable Public House and The House for Workers, shelters for the poor, hungry, and homeless. Built a dormitory for poor students of a teacher's college so they could concentrate on study. Founded The House of the Child Jesus, a shelter for abandoned children and single mothers and their children. Founded a convent for the Sisters of Mercy of Saint Joseph in 1884 so the sisters could help with these organizations; their mission was to work in boarding schools, and to care for the aged and sick. Wrote catechisms and other educational works. Today the Sisters continue their work in Poland, France, Germany, Italy, Brazil, Congo, and Cameroon. Born to the Italian nobility, the son of Count Robert of Volpiano. Born during a battle in which his father defended the island against Emperor Otto. When the island was lost, the Emperor became William's sponsor and patron. Educated from age seven in the Benedictine abbey of Locadio, Vercelli, Italy. Benedictine monk at Locadio. Monk at Cluny Abbey in 987 under Saint Majolus. Reorganized Saint Sernin abbey on the Rhône. 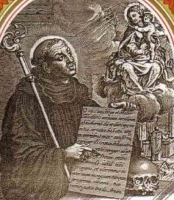 Abbot of Saint Benignus abbey at Dijon, France. Ordained in 990. Under his direction, and with his zeal for the Cluniac reform, Benignus became a center of spirituality, education, and culture, and the mother monastery of some 40 others in Burgundy, Lorraine, Normandy, and northern Italy. Noted for his zeal for the Church, his tender concern for the poor, his resolve and lack of intimidation when dealing with the politically powerful. Taught to read and write at home by his father, a man who became a priest himself. Moved into the Condat Monastery, Mount Jura, Switzerland at age seven, and stayed there the rest of his 61 years. Learned to read Greek and Latin, and became a noted Scripture authority. He refused to become ordained, saying he was unworthy to be a priest. 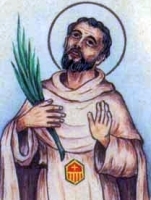 Chosen abbot of his house c.496; the monastery was later renamed Saint-Oyend in his honour, and still later was known as Saint-Claude. When the wooden monastery burned, he managed to get it rebuilt in stone; it lasted for centuries. Known for the extreme austerity, simplicity, humility and good cheer, and for his life of continual prayer. Sub-deacon in Rome, Italy. Spent most of his time alone in prayer and meditation. Imprisoned for his faith during the persecutions of Marcus Aurelius. Tried at Spoleto, Italy by Torquatus, the governor of Umbria, Italy, he was offered his freedom if he would renounce his faith and worship a statue of Jupiter; Concordius declined. The judge had him beaten and tortured on the rack; when he could speak, Concordius praised Jesus. After two more days in prison, Concordius was offered an idol to worship; he spat on it. Martyr. Priest and vicar-general of the archdiocese of Poznan, Poland. Chaplain of the Congregation of the Holy Archangels. Studied social science at the university in Poznan. Arrested for his faith in September 1939 during the Nazi invasion of Poland. Imprisoned in the Dachau concentration camp, he ministered to other prisoners, said a rosary daily as long as his health lasted, and was used for medical experimentation until the procedures killed him. Martyr. Fifth century missionary from Brittany to Britain, especially in Wales. Founded monasteries, including one whose site was chosen via a crozier with healing powers which led him to a tree with "three kinds of fruit". 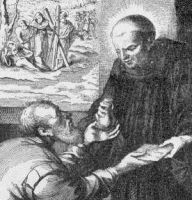 Augustinian hermit as a young man. With Blessed Angelus of Foligno, he founded a monastery in Gualdo Cattaneo, Italy in 1258, and served his remaining years as the prior of the house. For many years there was fellowship named for him, but it dissolved in 1568. Born to the nobility. Brother of Count Godfrey Le Barbu of Louvain. Priest. Canon of Metz, France. Prince-Bishop of Liège, Belgium in 1123. Founded the abbey of Saint-Gilles near Liege. Benedictine monk at the abbey of Saint Ferreol. Abbot of Saint Marcellus in Vienne, Dauphine (in modern France). Noted spiritual director, including work at the convent of Saint Blandina where his own mother and sisters were nuns. Was also known for a profound understanding of theology, yet a teaching style that made it clear to any student. Reputed miracle worker. Educated in the cathedral school at Troyes, France. Benedictine monk at Luxeuil Abbey where he was a spiritual student of Saint Waldebert of Luxeuil. Founded Moutier-la-Celle abbey near Troyes, France c.655, and served as its first abbot. Noted for his austere lifestyle, and his devotion to prayer. Member of the Salesians, taking his vows at Carabanchel Alto, Madrid, Spain on 28 July 1914. Ordained in Orense, Spain on 9 September 1925. Parish priest in Baracaldo, in La Coruña and in Santander, Spain. Arrested and executed by militia troops the Spanish Civil War for the crime of priesthood. Martyr. 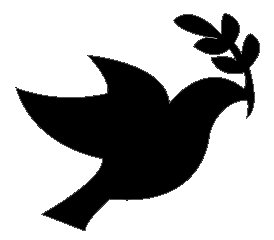 Feast day dedicated to peace. It first observed on 1 January 1968, proclaimed by Pope Paul VI. It was inspired by the encyclical Pacem in Terris by Pope John XXIII and with reference to Paul's encyclical Populorum Progressio. Popes have used this day to make magisterial declarations relevant to the social doctrine of the Church on such topics as the United Nations, human rights, women's rights, labor unions, economic development, the right to life, international diplomacy, peace in the Holy Land, globalization and terrorism. Early 5th century bishop of Mainz (in modern Germany). Saint Gregory of Tours writes about him in The Glory of the Confessors. The eldest of the Seven Founders of the Servants of Mary. First superior of the Servites, serving until 1256. Sister of Saint Enda of Arran, Saint Lochina, Saint Carecha and Saint Dareima. Nun. Persuaded her brother to become a monk. Noted spiritual director. Founded a convent at Rossory, Fermanagh, Ireland, and served as its first abbess. Because of her key role in the founding of Irish monasticism, many fantastic stories grew up around her. Hermit or monk from the eastern part of the Roman empire. He protested in Rome against gladiatorial combat, and was murdered by its supporters. His efforts moved the Christian emperor Honorius to ban the combats, and Telemachus is considered a martyr, saving many through his sacrificial death. Son of a man who became a priest late in life. Priest. Fled Rome, Italy to Tivoli, Italy during the late 2nd-century persecutions of emperor Marcus Aurelius. When all the people of Tivoli were ordered to sacrifice to idols, Concordius spat on them instead. Martyr. Priest in the diocese of Angers, France. Martyred in the persecutions of the French Revolution for refusing to swear the oath imposed on the clergy by the secular Revolutionary government. Layman in Ancyra, Galatia (modern Ankara, Turkey). During the persecutions of Julian the Apostate, Basilius publicly announced his Christianity in front of governor Saturninus; he was arrested, tortured, sent to Constantinople, tortured further, sent to Caesarea, and finally executed. Martyr. Received a doctorate from the University of Paris. Mercedarian friar. While ransoming Christians enslaved by Muslims in North Africa, he was captured by a Muslim prince, and ordered to convert to Islam; he refused. Martyr. Daughter of Meacher; descended from High-King Conor. Sixth-century nun associated with the church in Feart Scéithe (modern Ardskeagh), Buttevant, Ireland. Late 6th-century member of a gang of bandits who was brought to the faith by Colman Elo of Lynally. The name "miller" and its variants comes from his use of a mill as a place of worship. Fourth-century hermit near Plozévet, Brittany (in modern France). Missionary to the British Isles. Son of Eachaidh and Aighleann; brother of Saint Colum of Myshall; great-nephew of Saint Colman of Cloyne. Churches are known to have been named for him, and he is listed in regional martyrologies, but details of his life have been lost. Member of the Premonstratensians. Canon of Saint-Just-en-Chaussée monastery. In 1147 he was placed in charge of another Premonstratensian house which he led until his death. Bishop of Bourges, France. Had a special devotion to the Eucharist. Attended the Council of Paris in 573. Many miraculous cures attributed to his intercession. Praised by Saint Gregory of Tours, there was poetry dedicated to him, and he is still venerated at Bourges. Son of Arwystli Glof ab Seithenyn. Sixth-century monk on Bardsey Island, Wales. Built a church in the village of Lladyfrydog, Wales. A standing stone nearby is said to be a man who stole the bible from that church and got turned into stone. Sent by King Saint Lucius to Pope Saint Eleuterus to petition for missionaries to Britain, then returned to work as a missionary himself. Sent by King Saint Lucius to Pope Saint Eleuterus to petition for missionaries to Britain, then returned to work as a missionary himself. Bishop. May have been a bishop, may have been an abbot, may have been both; surviving records are very unclear. Venerated at Vallis Regia, Genoa, Italy. In a Muslim controlled area he was ordered to kiss the Koran; he refused. Martyr. Mercedarian nun at the convent of Jesus and Mary in Orozco, Spain. Career soldier who gave up the life of war for the religious life. Founded several churches and monasteries in Ireland. Lived to nearly 100. Born to the royal family of Eastphalia; sister of Blessed Liudbirg of Thale. Nun. 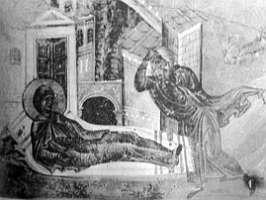 Fourth-century monk at Lerins Abbey. Bishop of Arles, France. Priest at Arles, France. Bishop of Aix, Provence, France. Known for his exceptional sanctity, his work in his diocese, and as a miracle worker. Benedictine monk of the Celestine Congregation at the monastery of Saint Laurence, Abruzzi, Italy. Lived on the isle of Bardsey. Venerated in northern Wales where an ancient stone church is dedicated to him. Benedictine monk. Abbot of the monastery of Stavelot-Malmédy Abbey in Belgium. Nun and abbess of Saint Brigid's convent in Kildare, Ireland. Thirty soldiers martyred in Rome as a group during the persecutions of Diocletian. We don't even known their names. Eight Christians martyred together in Africa, date unknown. The only details we have are four of their names - Argyrus, Felix, Narcissus and Victor. Collectively commemorates the lives and works of 48 hermits and monks who immigrated from Brittany to the British Isles to preach and found monasteries.